Hello, I am Torie of Torie Jayne Design! As a fellow pastel lover, I am delighted to be Louise’s guest at The Vintage Room today. I just adore Louise’s gorgeous style and am always lusting over her beautiful Instagram feed and blog. So it is a real treat to be nestled in here amongst such pretties! 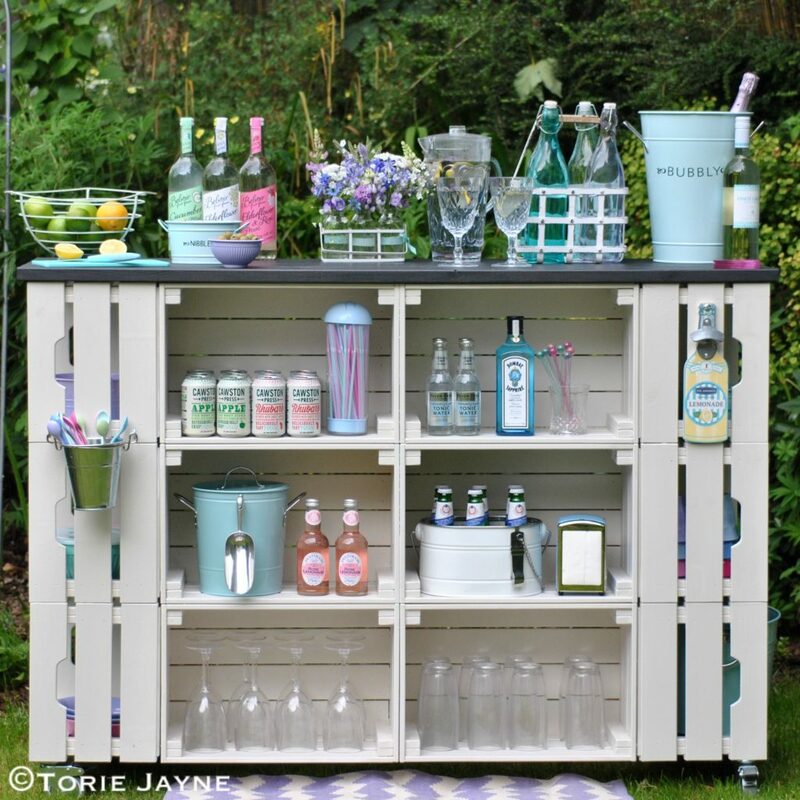 First up I am sharing with you my DIY Outdoor bar that I made using Ikea wooden crates and some outdoor decking. 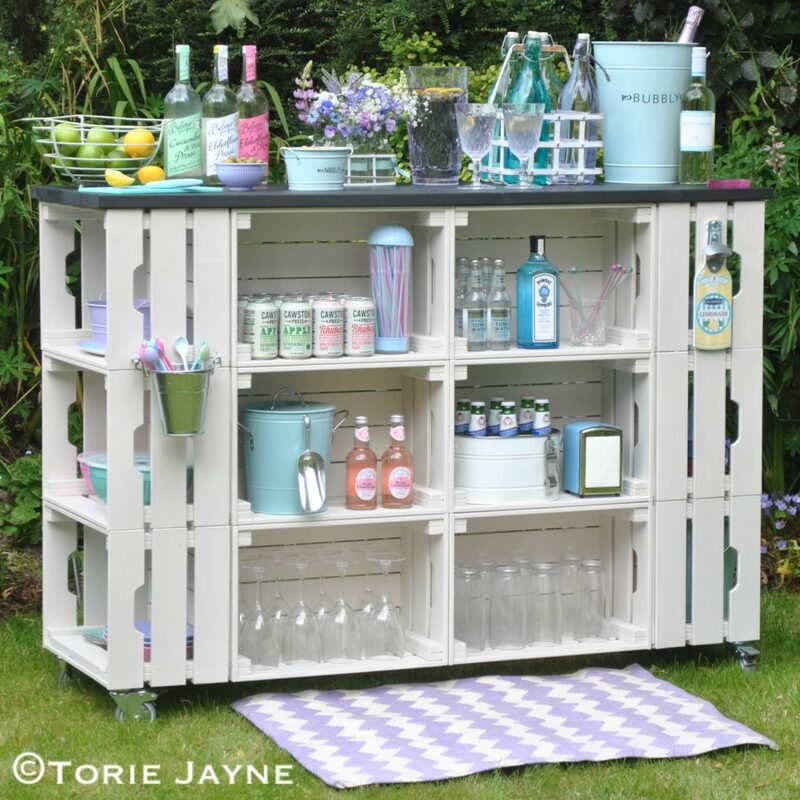 The outdoor bar has wheels on the base so you can easily move it around and set it up where you need it. 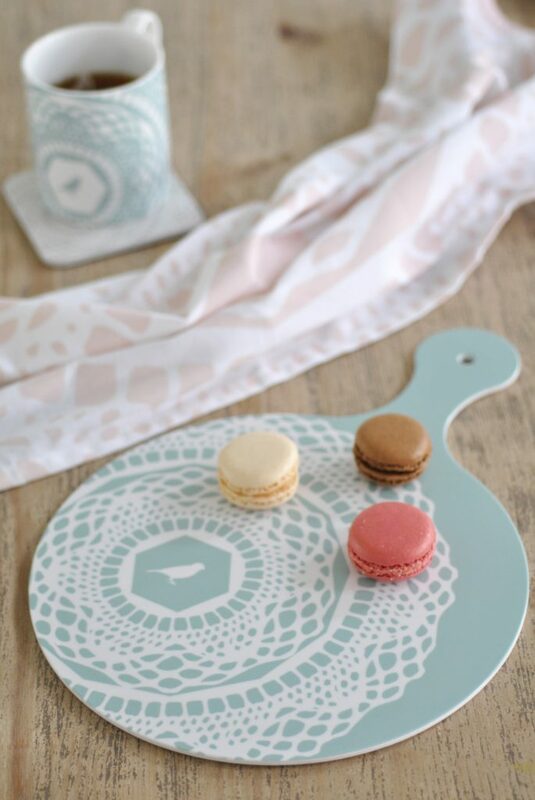 Perfect for parties, outdoor gatherings and entertaining at home! I love that it can be used for a variety of outdoor occasions and uses from a fully stocked bar to a serving area for sweet treats and BBQ accompaniments. 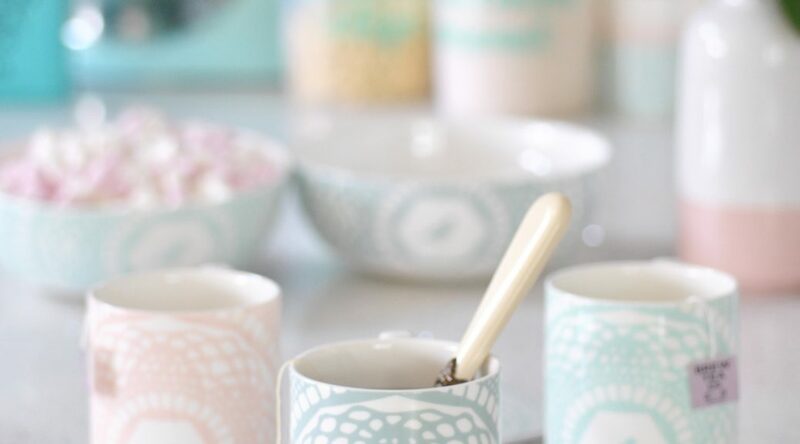 Of course all styled with pretty pastels! 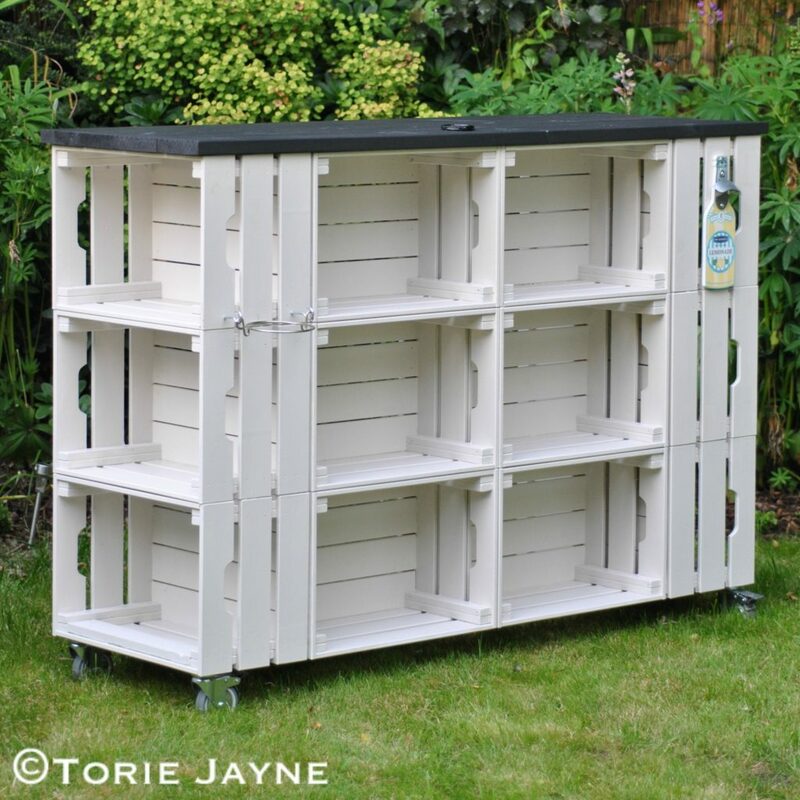 Start by priming your crates and decking in your chosen colours. Stack the crates in four sets of three, making sure to align them up. 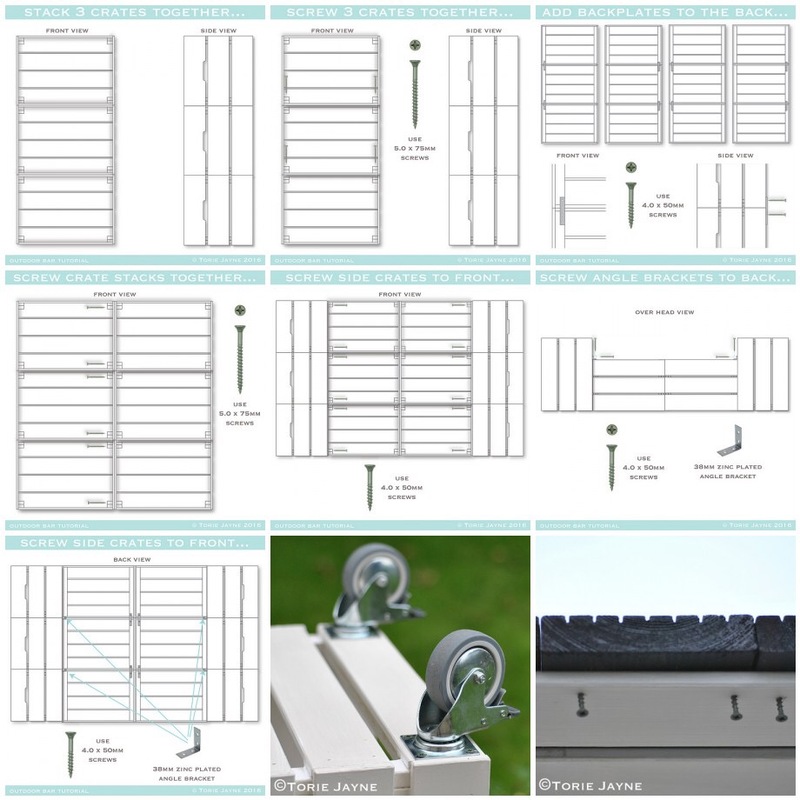 Add metal back plates to join the crates together at the back using 50mm screws. Take the two centre stacks of crates and place them side by side. Screw the two sets of crates together. Place the side stack of crates either side of the joined front crates, lining up the front of the centre crates with the side of the side crates. Screw the crates together using 50mm screws. With the back of the crates facing you. Screw angle brackets to the back of the bar to secure crates in place. Paint the entire crate structure, including the screw heads. You will need to do several coats to get a nice even coverage and protect it from the weather. Screw wheels to the base of your bar in the four corners. Screw the decking in place from the underside. 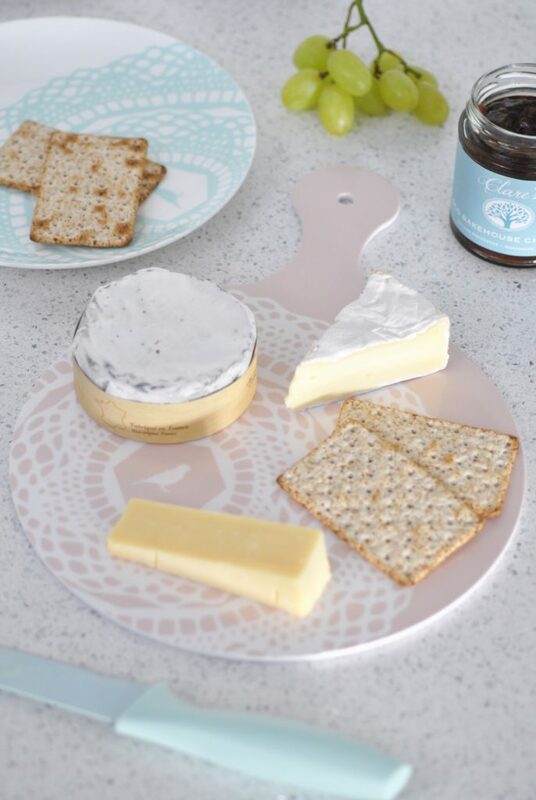 I can’t wait to use my melamine chopping boards on my DIY outdoor bar to chop lemons and serve cheese and crackers! Torie Jayne Design, founded by fashion designer, interior stylist, blogger and author Torie Jayne. (waving, that’s me!) 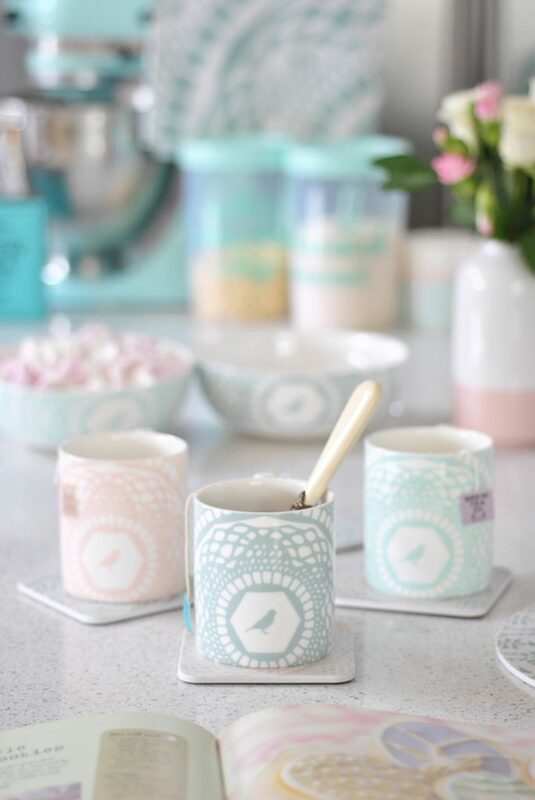 Torie Jayne Design is a new homeware brand consisting of custom designed homewares, all in Torie’s signature style colour palette of sophisticated chalky pastels. 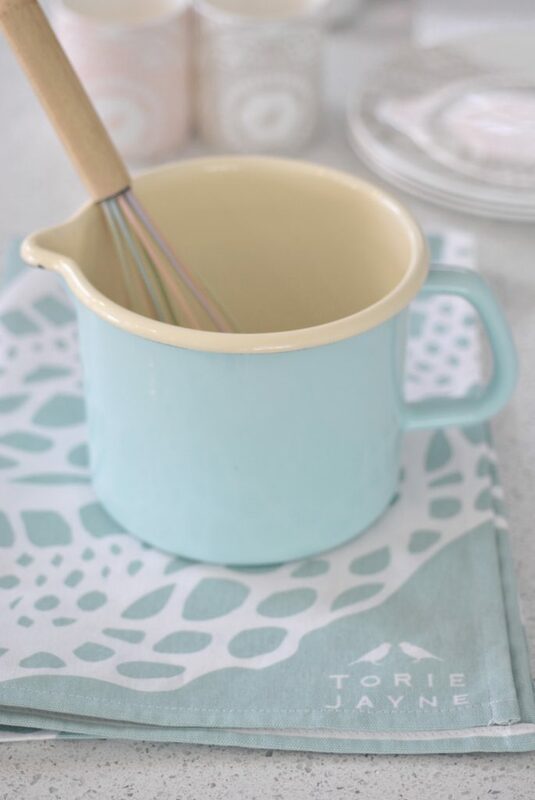 The first product collection is centred around the kitchen and consists of fine bone china, melamine chopping boards, and kitchen textiles. Every print has been developed using my love for ‘a little bit vintage’, ‘a dash of modern’ and obsession with bird print motifs. Designed to be fresh, stylish and distinctive. 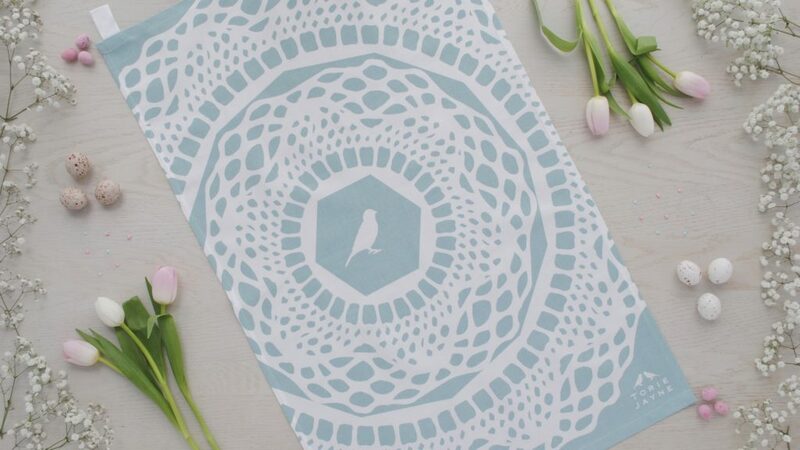 Everything in the <a href=”https://toriejayne.design/“>Torie Jayne Design</a> brand is lovingly designed in Devon with fine attention to detail, being proudly printed and manufactured in the UK to the highest standards. 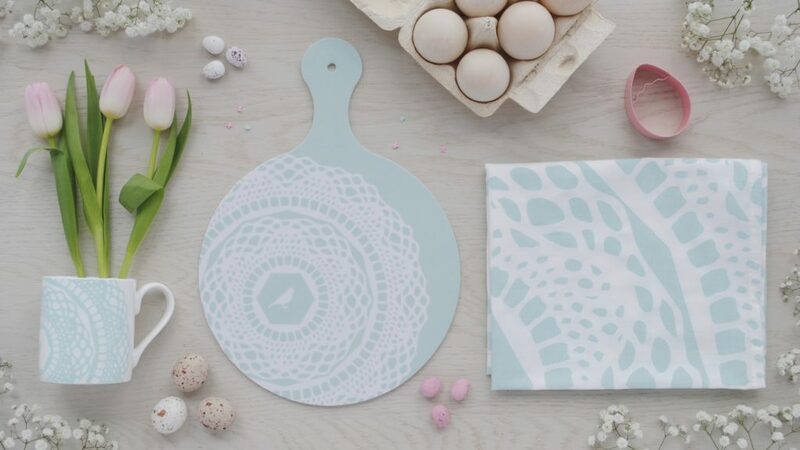 The kitchen linens are screen printed and hand made in Lincolnshire, the melamine chopping boards are moulded, printed and hand finished in Coventry, whilst the fine bone china is hand decorated and finished in Stoke-On-Trent using the traditional method of silk screen printed transfers. 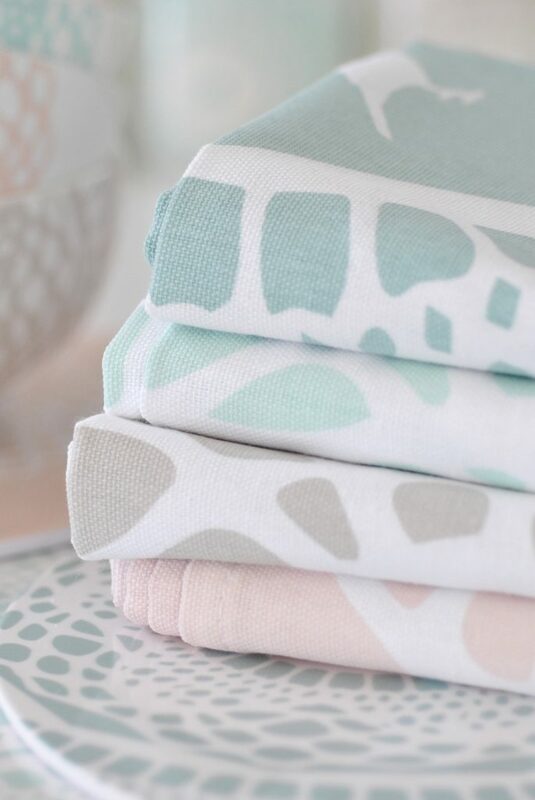 I would love for you fellow pastel lovers to get involved and help me launch a new British brand; Designed in Devon, Made in the UK. 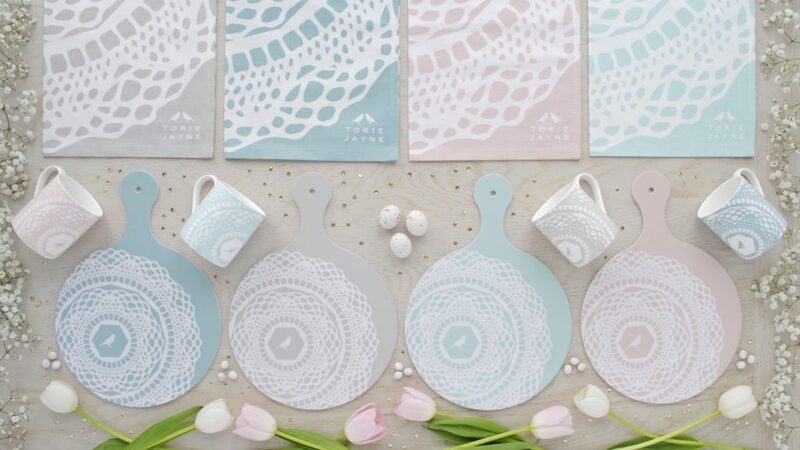 To be part of this new exciting story head on over to my Kickstarter campaign,<a href=”https://kck.st/2JAgECf“>Torie Jayne Design – Beautifully designed stylish homeware </a> where you can check out a cute video I made and pre-order the items you love. For helping me at this stage, in return I am offering you products at a discounted price. 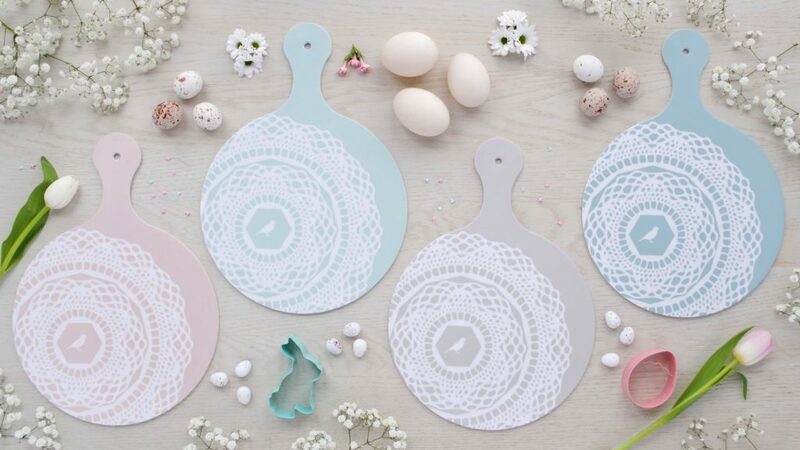 You can choose from a variety of different pre-order rewards from a single tea towel, mug or chopping board to multiples of different products. The more you buy the more you save! You can of course have them in any colour combination your heart desires. If you are new to KICKSTARTER, you may not know that If you pledge now the money will not be taken from your account until Tuesday the 1st of May and only if our project is 100% funded. I launched my project on Kickstarter as I need to raise a minimum of £5,000 in order to meet the minimum order quantities (MOQ’s) from the manufacturers. We are 47% funded already but I need your help! As an extra incentive, if you mention ‘The Vintage Room’ when I message you thanking you for your support I will add in a limited edition ‘Maisy’ print postcard to your package. Thank you Louise, it has been a joy!